Bishops’ House – Ken Dash, Archaeologist and Historian — 29th June 2015. Bishops’ House is a Grade II listed, half-timbered house, in Norton Lees and loc­ated on the south­ern tip of Meersbrook Park. 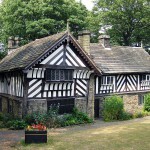 It is one of the oldest timber framed build­ings in Sheffield and typ­ical of a large farm­house or small manor house from the 1500’s. Other sur­viv­ing timber-framed houses in the city are Carbrook Hall/Inn and the Old Queen’s Head public house. It is now known as Bishops’ House because it was said to have been built for 2 broth­ers , John and Geoffrey Blythe, both of whom became Bishops of Salisbury and Lichfield/Coventry respect­ively. However, there is no evid­ence that they ever lived there with the first known res­id­ent being a William Blythe, a farmer and scythe maker who was living there in1627. The first record of the house being called Bishops’ House was in 1886 and this was con­firmed in the 1891 census . Samuel Blythe was the last of the family to live in the house and after his death in 1737 the house passed out of family own­er­ship and the estate was let out to tenant farm­ers. The Meersbrook estate was even­tu­ally sold to a Samuel Shore around 1783 but the family for­tune col­lapsed and the estate was sold, some to prop­erty developers with plans to demol­ish Bishops’ House. Pressure from the public and the need to pre­serve open spaces saw own­er­ship pass to Sheffield City Council in 1886. The parks author­ity con­tin­ued to use Bishops’ House as a dwell­ing house for park employ­ees until the 1970’s when the house was restored and turned into a museum open­ing in July 1976. Today The Friends of Bishops’ House arrange school visits and it is open to the public at week­ends. As you would expect, a Derbyshire farm house of over 500 years old has had many layout and struc­tural changes. The ori­ginal build­ing had no found­a­tions, It was built with inter­lock­ing beams and frame­work with 3 bays of single room deep to make it easier to erect the roof which was tiled and not thatched as one would ima­gine. No chim­neys meant the interior was sooty and dark. In 1550 the west bay was knocked down and rebuilt at 90 degrees to the ori­ginal build­ing with a second storey with oak floor­ing. There were 2 rooms upstairs and a par­lour and but­tery ( to store bar­rels of beer) on the ground floor. These were 2 sep­ar­ate dwell­ings, but over the years and at dif­fer­ent times the dwell­ings were knocked into one. 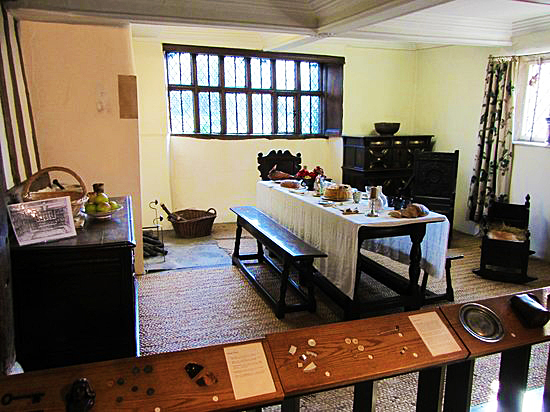 In the mid-1600’s, the hall in the ori­ginal build­ing was made into 2 storeys with the addi­tion of a floor , the new room being used for stor­age. Windows, fire­places, dec­or­at­ive plaster work and stair­cases have been added to the build­ing over the cen­tur­ies. This blog cannot do justice to this mag­ni­fi­cent house. You really need to go and see it in all its splend­our. Ken gave us a most inter­est­ing talk with great enthu­si­asm for his sub­ject. As he developed his present­a­tion, he hinted at other areas of pos­sible research all linked with Bishops’ House. Clearly, he is going to be a very busy man in his retire­ment.